To achieve the best overlay accuracy in correlative microscopy, one ideally acquires both the fluorescence and electron images on the same resin-embedded section. 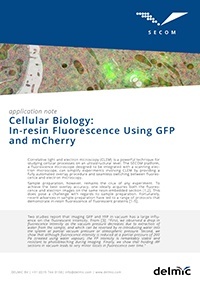 Recent advances in sample preparation have led to a range of protocols that display in-resin fluorescence of fluorescent proteins. To learn more, please submit your information using the form to the right in order to download this application note for CLEM.